(Days 16 & 17) That’s It I Surrender! So now I am assessing my week and I see a pattern of 3 good days and 2 not so good days. The common denominator for the 3 good days is that I started me day with my planner at the place of prayer and sought the Lord to help me plan the day. Then at the end of those days I moved over anything that wasn’t accomplished to the next day. No condemnation, no guilt, no stress just grace and mercy. On the other 2 days, I woke up late, jumped into my day without my morning prayer time. I had times of prayer during those days but there was no plan for the day. The day just started and before I knew it I was in the fast lane of busyness. That’s it, I surrender! I surrender! I can’t do this one my own. I need to depend more on Jesus! I know what my goals are, I know what my why is, I know what the plans in my heart that I want to accomplish are to get to the next level in my journey. I cannot do it alone. I have to consistently bring the Lord into my plans. 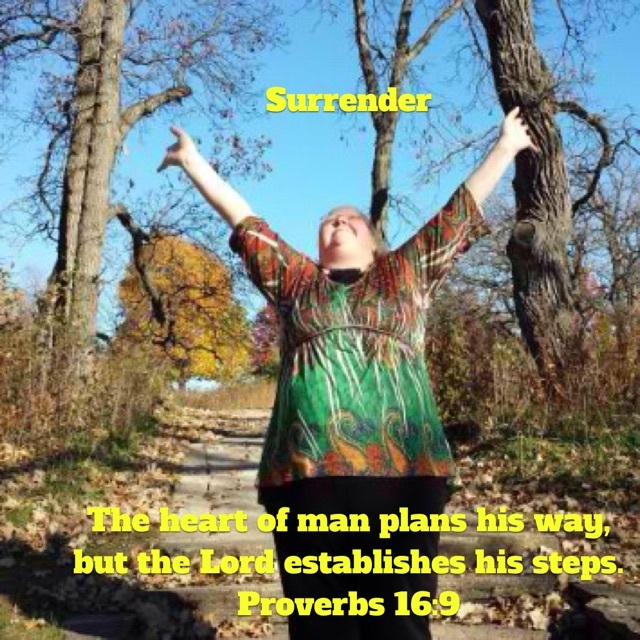 Today’s verse says “The heart of man plans his way, but the Lord establishes his steps.” Proverbs 16:9 ESV. Last week’s verse says “Commit to the Lord whatever you do, and he will establish your plans.” Proverbs 16:3 NIV. I thought just committing to the Lord whatever I do would cause the Lord to establish my plans and that is true. But when I look further and see that I can plan my way but the Lord will establish my steps, oh that brings a peace to my heart. So I surrender to this truth today. Lord you know the plans and intentions of my heart. Establish my steps so that my life brings you glory. Help me to rise early and bring my schedule to you so that I truly learn to walk this journey with you depending on you every step of the way. Thank you for being patient with me as I learn each day to apply what I am learning. It’s all about you Jesus. Thank you for grace and mercy. Thank you for teaching me and training me by your Word. Amen. Oh by the way before you leave, DaySpring.com is celebrating all of the amazing Write 31 Days readers who are supporting nearly 2,000 writers this October! To enter to win a $500 DaySpring shopping spree, just click on this link & follow the giveaway widget instructions. Good luck, and thanks for reading!